The human nervous system is composed of approximately a billion neurons. The neuron's basic function is to transmit impulses to and from the various tissues and organs of the body. While there are numerous types and sizes of neurons, most share common structural attributes. Neurons generally exhibit four basic structures: dendrites, soma, axon and synaptic terminals. Dendrites are cellular projections which serve as receivers for incoming stimulation. The incoming stimulation may be in the form of an intracellular ion exchange, or chemicals released into the gap (aka synapse) between the cells. The ion exchange or chemicals released can cause a change in the balance of ions on either side of the postsynaptic dendritic membrane. If enough dendritic membrane is stimulated, a wave of ionic imbalance can be propagated which will travel across the dendrite and onto the soma or cell body. An ionic imbalance sufficient to travel the length of the cell is called action potential. During an action potential the polarity or charge of the intracellular compartment changes from strongly negative (-) to positive(+). The soma is the primary site of cellular metabolism and genetic storage. Its broad membrane surface serves as a collecting point for the ionic waves propagated in the dendrites. If enough simultaneous ionic waves break onto the soma, an action potential can be generated which will traverse the soma to the axonal hillock (see cells A & B above). Conversely, if the ionic differential is not adequate, it will dissipate across the soma and no impulse will be transferred by that neuron (see cell C above). The axonal hillock is the juncture between the soma and the axon. It serves to collect and focus the action potential for entry into the axon. The axon is a neuron projection which allows an action potential to span large distances. Some axons are more than a meter in length and contain as much as 500 times the volume of the cell body! An action potential traverses an unmyelinated axon membrane in the same way that it does the soma, simply depolarizing the membrane in front of it. A myelinated neuron depolarizes a bit differently. The insulating properties of myelin force the current to flow from one node to the next. This process is called saltatory conduction and is a more rapid process, allowing myelinated neurons to conduct up to fifty times faster than unmyelinated neurons. CNS neurons primarily in the brain are myelinated by a type of neuroglial cell known as oligodendrocytes. They perform protective and nutritive functions similar to Schwann cells in the PNS. 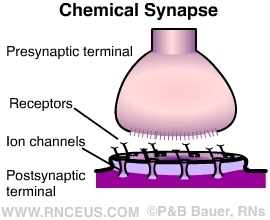 Synaptic terminals are the business ends of the neuron. There are two types: electrical and chemical synapses. Electrical synapses are in direct contact with the adjoining cell by means of gap junctions, which are small channels through which ions pass from one cell to another. Chemical synapses are more common and the ones of interest in this course. They are composed of the presynaptic terminal at the end of the axon and the postsynaptic terminal located on a dendrite and shaped to receive the neurotransmitters as they diffuse across the synaptic cleft. An action potential is a wave of depolarization sufficient to cause a release of neurotransmitter into the synaptic cleft.